This is a fun easy recipe great for family reunions and BBQ s this summer. 2 Pkg of your favorite icecream sandwiches. I used Meadow Gold Mint Choc Chip. Layer 1 box of sandwiches on the bottom of cake pan. Next use 3/4 of your caramel topping on the layer of ice cream sandwiches. Your 3rd layer is the 2nd box of ice cream sandwiches. Then cover the top and sides with cool whip. Drizzle remaining caramel and chocolate on top. You could add your favorite candy bar as well. Have fun this is an easy and very versatile recipe. Everyone has a vinyl decal for their truck and trailer. 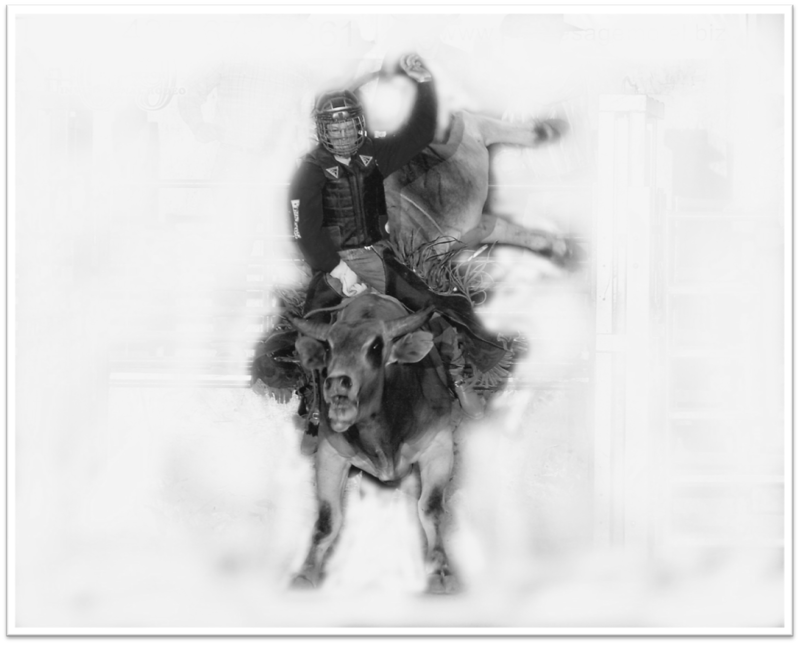 Most of us just have a generic image of our favorite rodeo image. Why not have the best? You can have your favorite image personalized with your favorite people. We can take most high quality images and turn them into a vinyl decal perfect for personalizing your Truck, Trailer, or home decor. For pricing and more information contact Lisa with lisasvinylcreations.com email lisa@lisasvinylcreations.com. Pete has instructed Justin Anderson Utah State High School Champion and many other to win. Come learn the basic on equipment, safety and riding. 1st 10 Riders to Send $50 Deposit will be entered. Call Teresa Fackrell at 435-623-5374 or email at teresa@allhorseutah.com. $10.00 entry fee per event. Each rodeo will be a jackpot with points being accumulated from the five rodeos to determine series champions. Awards will be given out at the Sept. 6, 2010 rodeo for the three age divisions, buckles for event champions and saddles to all-around champions. All stock events will be $12 entry fee and non stock will be $10 entry fee, remember it is CASH ONLY/ NO CHECKS! Age group is determined by contestant’s age as of January 1st 2010. Contestants can only earn points in their top four events for Juniors and Seniors and their top three for Pee-Wees but can compete in as many as they want for money payout and end of year event prizes. Points collected count towards all-around prizes which will be awarded following the last rodeo on September 4th. A saddle will be awarded to the all-around boy and girl in each age group. Please check Rules and Regulations for decisions on points, how they accumulate, how ties are decided, etc. More information is available at www.daggettcounty.org/ccjr. We invite you to participate with us as our guests learn what it is like to be a part of a rodeo. We are interested in having young “real” rodeoers help with our event and/or do some demonstrations between our rodeo events on each of the two days. Remove dried clay with a dull knife or a spoon (or go outside and give the garment a shake). Apply liquid dish soap to the stain and let it sit overnight. Machine wash. If any stain remains, apply a color-safe bleach directly on the fabric or flush with rubbing alcohol, then machine wash again. 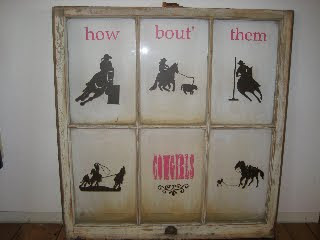 Four day camps covering Girls Rodeo Events!!!! Camp will be held June 15-18 in Freedom (Moroni), Utah!! 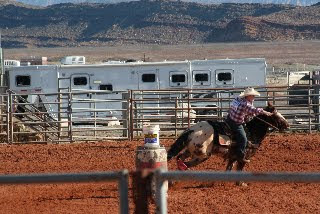 At each camp day 1 will be barrel racing, day 2 pole bending, day 3 goat tying, and day 4 breakaway roping. Camp is open to students ages 6 and up. All students must be able to handle their own horse. Each camp is limited to 12 participants. Sign Up Now to reserve your spot!!! Fee is only $325 per student for 4 days, $255 for 3 days, $180 for 2 days, or $100/ day (family rates can be offered for more than one member in the same family and single day fees are available). Fee includes instruction, stock, food, craft items, pen for your horse, and one dutch oven dinner!!! Campers my commute to and from the facility, they may bring their own trailers and plug in, or they can "camp out" in tents. The choice is yours!!! Don't miss your chance to learn and become more competitive while having fun among friends!!! 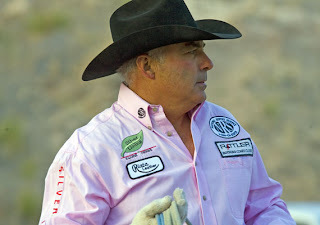 Allen Bach Clinic, featuring 2-time World Champion Matt Sherwood, in the beautiful Utah mountains. 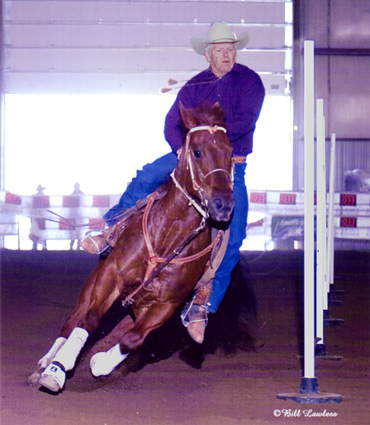 Allen specializes in training ropers at all levels to win. 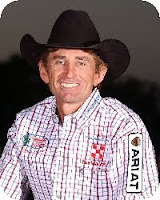 He is the highest money earner in the history of PRCA team roping. Proving that he has developed a way to win with any partner in any situation. When you leave you will be equipped to win more than ever. For more information go to www.allenbachroping.com. Wow! Where did the last couple of weeks go? Don't you have to ask yourself this sometimes? Well it started May 21st with a 3-day Little Britches Rodeo. Then came graduation on Wednesday. Followed by traveling to a Joe Beaver Tie Down School on Friday. Then we had nieces and nephews for the first week of summer. Followed by getting ready for State High School Rodeo Finals. Whew! The Joe Beaver Tie Down School was amazing! I would highly recommend it to anyone. Those boys worked hard for 2 solid days but they all came away with things that will definitely improve their times. Brent not only got to meet his idol but he got to rope in front of him and have him help him personally with his roping, flanking and tieing. Honestly, I learned more in this school than any other rope school that I have went with my kids. Brent went from roping 17-18 to his final time of 12 seconds. He has been so motivated since we got home. He is doing something to practice tie down for over an hour every day. To find the school closest to you, go to www.joebeaver.com. Anyway, although we are in full time rodeo season, we are getting back on track with Rodeo Moms Club. Look for a lot of new events coming up and another contest! "All successful people have a goal. No one can get anywhere unless he knows where he wants to go and what he wants to be or do." Entries are limited so students will have more personal instruction. Most of the time we may not see our kids as the athletes that they are. We might make sure that our horses have the best nutrition including supplements but do we do the same for our kids. Several of you may answer yes. But I have been to too many rodeos to see the snacks and foods most parents are handing their kids. Most parents are handing their kids sodas, crackers, cookies, candy, rodeo burgers, nachos and a myriad of other junk. These are all empty calories and doing nothing to build the body of an athlete. They may provide a temporary energy boost but there is always the sugar crash. On top of the overload of sugar in soda, it also reduces your endurance and strips vital nutrients from your body. Crackers, cookies and chips do not provide any of the essential nutrients your body needs to get stronger. Little Britches has an event for Little Wranglers and Jr Boys called, Flag Racing. I first did this event in 4-H and then in some riding clubs. It is a gymkhana event that has a few variations according to the association. I have to say when I watch my little boys have a good run this is one of my favorite events. The course consists of two barrels set on opposite sides of the arena approximately 100 feet from the starting line. On top of the left-hand barrel is a bucket of oats, on the top of the right-hand barrel is a bucket of oats with a flag sticking in it. The contestant is given a flag at the gate. The object is to ride around the pattern as quickly as possible, STICKINʼ the flag carried in the left hand bucket and PICKINʼ the flag in the the right-hand bucket and carrying it back across the start/finish line. A contestant is disqualified for knocking over the barrel or bucket, failing to get the first flag in the bucket, failing to retrieve the second flag, for circling the barrel, going on the wrong side of the barrel, using the flag as a whip, or if either flag is dropped. Carrying the flag anywhere but in the hand results in a five second penalty. This what we are talking about when we yell look. You gotta get you head and body pointing the right direction so the horse can finish their turn. 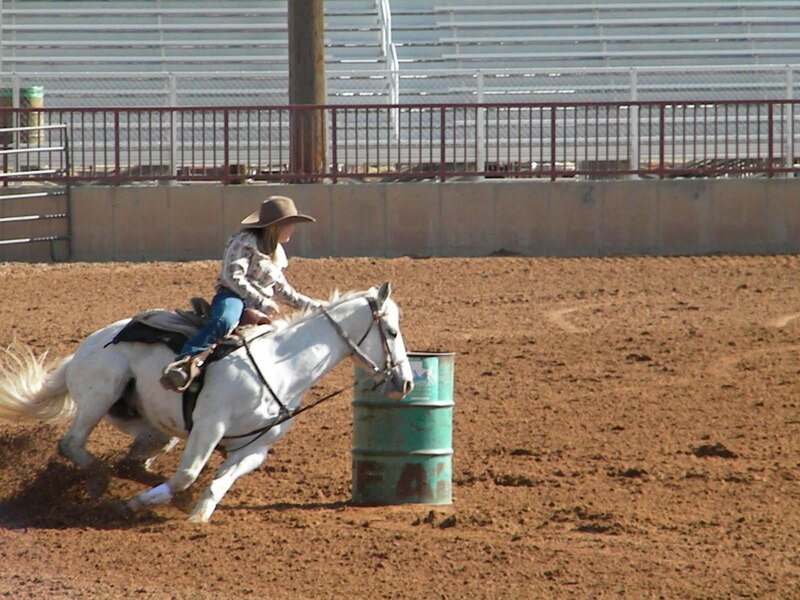 Love seeing how deep those barrel horses get into their turn. As you look at each week, you may feel overwhelmed with so many things to get done. As a rodeo mom, you have daily mom duties but you also have to make sure that your chores are done, your kids get to school, you go to work and you get your kids to practice. This week for example, not only do I have to work a full time work schedule but we have a rodeo to put on for High School Rodeo that is Friday and Saturday. In addition to working, I need to get the all the laundry done, go to the grocery store, pack the trailer and get my kids to practice at least 3 days this week. Plus finish the program for the rodeo and enter all the jackpot information. Here are some tips to help get you through it and get motivated to do more. First, congratulate yourself. Women are amazing. We are great at multi-tasking. Although I may be stressed about it today, by Friday I know I will have everything ready and we will have a great weekend at the rodeo. Second, can I mention lists? The best way to get things done is to know exactly what you need to do. So today before I leave work, I will make a list of all the things that need to happen by Friday. Also when, I clean and go through the trailer we are staying in, I will make a list of things that need to be bought before we go. You should also prioritize the list. There is always too much to do. So make sure you only do what is important. There is a great sense of accomplishment when you get mark things off of the list. Third, put your priorities on a schedule. Most people waste a lot of time because things are not scheduled. If you break your tasks up into manageable pieces of time, you will get a lot more done. Also, you need to learn to set time limits for things. For example, tonight we only have 2 hours for practice because we need to get home and start cleaning the trailer. So only practice for 2 hours. It is way too easy to let things go beyond schedule but if you stick to it, I promise you will get more done. Scars remind us where we've been, they don't have to dictate where we're going. See more information about Ken Smith here. This is a great picture of getting the rope around the calf's neck. However sometimes when I look at rodeo pictures, I really wonder how horses move like that. We catch them at the weirdest angles. Although this is a breakaway tip that we have talked about before it is extremely important. The best way to have the fastest time in breakaway roping is to get your rope going quickly. You should be swinging as soon as you nod. There is no other way to be in the 2 to 3 second times without swinging fast. 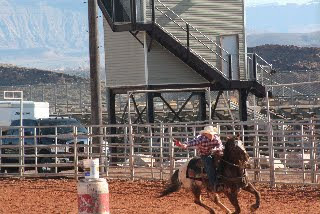 As you can see in the picture, the calf is not even completely out of the chute but his rope is already in full swing. Even when you are practicing, start your swing in the box. You may even want to take a few runs where you don't rope but just get that start right. So let the calf out focusing on getting your swing started. Sometimes you need to just work on one thing at a time. Sometimes the thing I like best about youth rodeo is the family moments. When parents are making sure everything is just right before the kids enter the arena. They try to give them the best chance for a winning performance. *Deposit of $150 will guarantee your spot. **BUCKLE given to winner of the Jackpot following the school. **Other awards and certificates will also be given. 1) In the morning put chicken and all ingredients in the crock pot on low. 2) When you get home from work or an hour or so before eating, shred the chicken. 3) Then serve with your favorite taco condiments like sour cream, guacamole, or salsa. This is a really delicious easy recipe that you can have cooking while your family is out practicing. Then all you need to do when you come in from practice is break out the tortillas and fixings and you have an easy dinner. It is also great for salads, quesadillas and burritos. Our 3 lucky winner have been randomly chosen. The winner will receive their quote n vinyl from Lisa's Vinyl Creations. 'Tough times don't last, tough people do"
"Don’t go where the path may lead. Go instead where there is no path. . . and leave a trail." "Winning isn't everything but, wanting to is!" We appreciate your comments. There are a lot of really great quotes and motivations for other to use. If you are one of the lucky ones above, just contact Lisa at lisa@lisasvinylcreations.com. Friday May 21 Rodeo at 6:00 p.m.
Saturday May 22 Rodeo at 11:00 a.m.
Sunday May 23 Rodeo at 9:00 a.m. Entries must be mailed by May 7. Entry forms are available at www.nlbra.com. Entry fees are $15 per event with $5 stock charge for roping events and $15 stock charge for rough stock. No Late Entries will be accepted. Stalls are $15 per night per horse. Entry forms available on www.nlbra.com. More information visit our site Central Utah Little Britches. A good rule of thumb for a rodeo mom is to have a vet kit on hand. You never know when you are going to have to clean, dress and administer a little helping hand to your best ride or someone else in the rodeo family. Our first contest ends this Thursday April 15. Be sure to get your entry today! 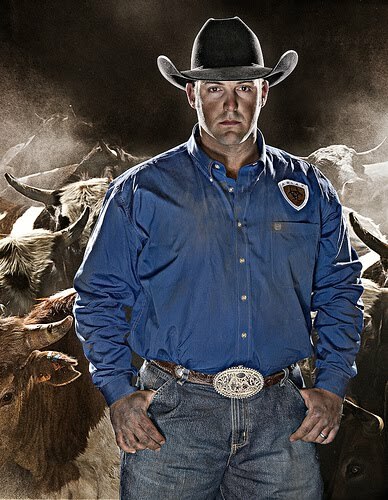 Just submit your favorite motivational or rodeo related quote. Your quote can be turned into vinyl art by Lisa's Vinyl Creation. But don't be afraid to be willing to pay the price." 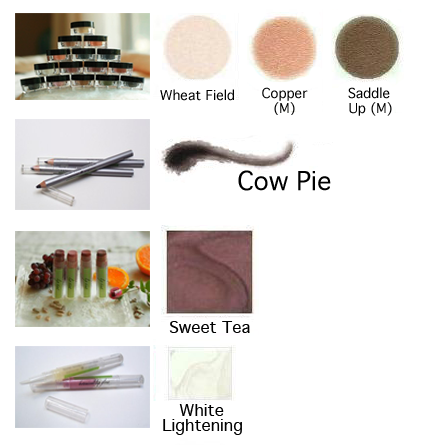 Cowgirl Dirt is an all natural, organic mineral makeup line made with all cowgirls and cowgirls at heart in mind. Unlike Bare Escentuals™ and Bare Minerals, we don't use parabens, chemicals or unnecessary fillers while creating our products. 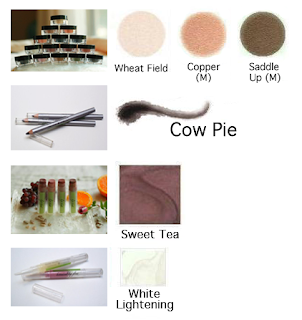 If you are currently using Bare Escentuals or bareMinerals you owe it to yourself to give our products a try - you and your cowboy will both see the difference! 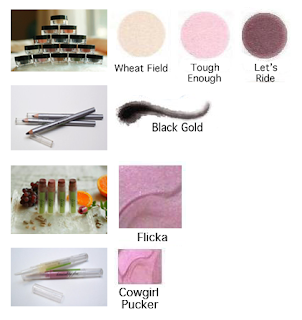 The Cute Cowgirl Package includes the Wheat Field base eye shadow, along with Matte Copper and Matte Saddle Up eye shadow. 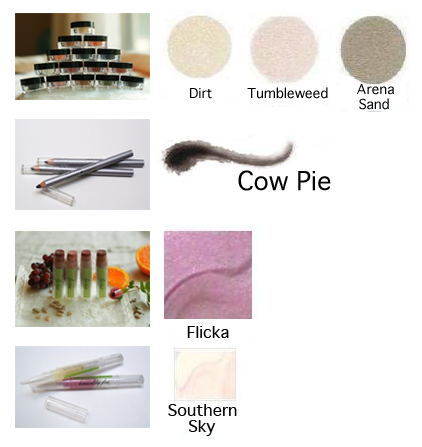 It also includes Cow Pie eye liner. Topped off with Sweet Tea lip tint and a glossy White Lightening lip gloss. Flirty Farmgirl is all about pink. This package includes Wheat Field eye shadow (base), Tough Enough, and Let's Ride. It comes with Black Gold Eye Liner, Flicka Lip Tint, and Cowgirl Pucker Lip Gloss. Barn Beauty is all about natural colors. It starts with a Dirt base eye shadow. Followed by Tumbleweed and Arena Sand eye shadows. Cow Pie eye liner and Flicka lip tint top it off. Southern Sky will give that extra glow you need. Rodeo Razzle is for those evening nights out on the town. Start with a base of Rhinestone. 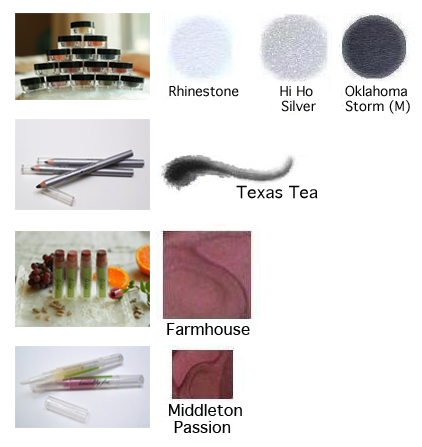 Then add Hi Ho Silver on the lower lid and Oklahoma Storm in the crease. Includes a Texas Tea color Mud Slinger Eye Liner. The final touch is the Farmhouse Yee Haw Lip Tint and Middleton Passion Bodacious Lip Gloss. You will look stunning! To order or learn about other products call Lisa Woodland (801) 372-6176 or email lisa@lisasvinylcreations.com. 1) Do some steer stopping. Instead of letting him go left. Ask him to stop straight and stop the steer. 2) Don't dally immediately. Leave some slack in your rope. Force him to track the steer for awhile, then dally, and turn it off when you are ready. 3) Work on control. When you are not roping, work him off your left leg. Do some basic roll backs and side passes. This will help you have better control when you are roping. 4) Just track some steers. Get him out of the habit of roping quick and going to the horn. 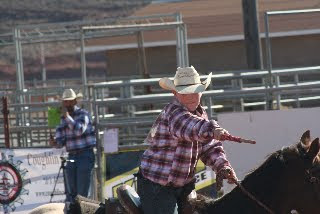 Several times during practice throw your rope but just track the steer to the bottom of the pen. 5) Adjust your position. If you are not leaning left and moving left, the horse won't go left early. Stay straight and change your position when you are ready to turn. The key is to mix it up so the horse is not trying to get ahead of you. Get control and don't let the horse decide when you are ready to go left.